A nice large pack of ground up, dried very hot chile peppers imported from Thailand. Rather than buy this pack of ready-made ground Thai chiles, many chefs like to purchase whole dried chiles, and make ground Thai chiles in their own kitchen just before use (see below). Adds hot spice to any dish, and always served in the Thai condiment caddy (see below). This is a very common Thai condiment, and you can add it to nearly every recipe found in our recipe section. Add as much as you like, but be careful--this may make you sweat. This product has the prestigious Shell Shuan Shim award. 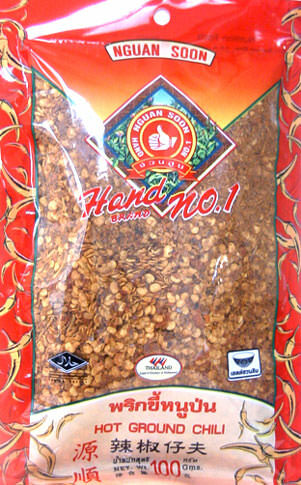 We are currently shipping brand new stock, highest quality Hand Brand brand 3.5 oz pack of identical ground Thai chile powder.